A). The body cavity is filled with fluid, which often simply runs out when the abdominal wall is cut open The fish is affected with abdominal dropsy If both eyes are swollen, or you see damage to the lateral line, this is dropsy and is hard to cure. Try raising the temp up to 84 degrees fahrenheit. Treatment: Doxycycline/Kanamycin combo treatment for up to 2 weeks. B). The fluid in the body cavity is viscous, the organs are atrophied and the intestine is glassy This specimen is also affected by abdominal dropsy If both eyes are swollen, or you see damage to the lateral line, this is dropsy and is hard to cure. Try raising the temp up to 84 degrees fahrenheit. Treatment: Doxycycline/Kanamycin combo treatment for up to 2 weeks. C). Worms have penetrated into the body cavity Various worms can penetrate the intestinal wall. Usually, however, only Camallanus and Acanthocephalans are seen. Camallanus worms are hard to kill. Levamisol will not kill them. If the worms are spotted early on, treat with Paracide-D in the food & De-los in the water. This works well. D). There is allot of blood in the body cavity due to hemorrhages from the internal organs Phenol and Ammonia toxicity can cause hemorrhages. Bacterial diseases like Furunculosis and Fibriosis also can lead to hemorrhages For toxicity (poisoning) change the water several times. For Furunculosis or Fibriosis, treat with Furazolidone Powder -or-Oxytetracycline. E). Light or dark cysts appear on the organs Encapsulated worm larvae (Capillaria), or sporozoan and tubercular cysts can be involved For worm larvae, treat with: Paracide-D For tubercular cysts, there is no suitable treatment known. F). After the side of the body is lifted up, you can see how the turgid anterior gut has displaced the liver to the side The fish has intestinal blockage. You can see undigested food in the intestine Treat with: Paracide-X. 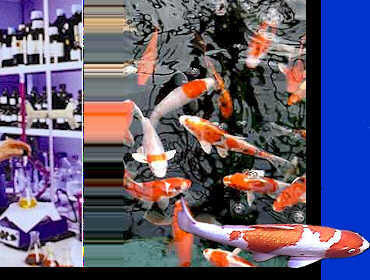 Feed the fish with vitamin enriched foods. Do not feed any pellet types of food. 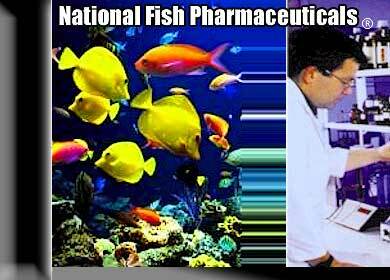 Â©1995-2006 www.nationalfishpharm.com - Site Map - Site Design by Brian Aukes & AFAM LLC.